TV Version: Perennial wallflower Sarah Jones was having a tough time getting used to life in wild and woolly Akron, but a chance encounter with an old crone has turned her life upside-down! Now, whenever shy Sarah puts on the strange headband the crone gave her, she becomes magically transformed into the vivacious and outgoing Sasha! Comedic hijinks ensue as Sarah/Sasha tries to manage her double life and deal with her confused-but-smitten co-worker Dale Drylook and disapproving landlady Mrs. Bluenose. Coming this fall to NBC! Movie Version: What could turn an innocent co-ed into an DEMONIC FORCE OF BLOODY VENGEANCE? 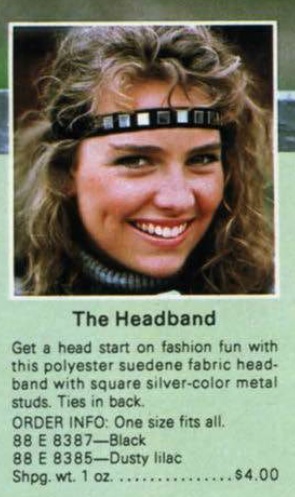 Learn the horrible truth — IF YOU DARE — in THE HEADBAND where MURDER is the ultimate fashion accessory. Now available from Vestron Video on VHS and Beta formats. Comics Version: The Disco Dazzler has battled some of the toughest customers in the Marvel Universe, but she hasn’t faced anything quite like The Headband. Who is this unstoppable foe and what connection does she have to Dazzler’s troubled past? Discover the shocking truth in Dazzler #8!